Via Yelp: Nothing is more frustrating than locking yourself outside your own apartment on a Sunday morning. I took my dog out for a walk in Hollywood, the moment my door slammed I knew I’m in troubles. 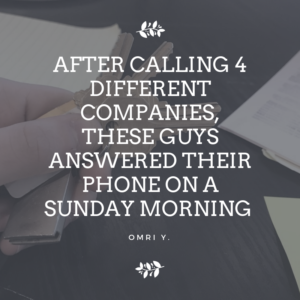 I went on Yelp and after calling 4 different companies, these guys answered their phone on a Sunday morning. The guy over the phone was well trained with dealing with my frustration and I had a technician at my doorstep within an hour. The price was fair and they completed the job very fast. They also made me a new key so I can leave at my neighbors for future incidents. We why like it: It’s extremely upsetting when you lock yourself out of your apartment, but it’s even more frustrating when you can’t get a hold of anyone to help you. That’s why we stay open 24 hours a day, 7 days week and mean it. It also shows our experience in dealing with frustrated customers and helping them relax and get back to their day as quickly as possible. Thank you Ormi for your review! Have experience working with us? Leave your review on Yelp and we’ll reach out to send you a free Tile key tracker as a sign of appreciation.